A rustic take on glamorous Old Hollywood era design, this solid oak counter stool is an ideal accent piece for casual kitchen counters and sleek modern bars alike. 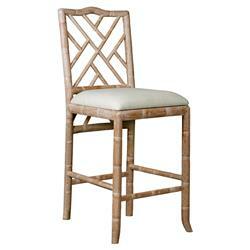 The Asian-influenced, Regency design features a faux bamboo frame with bold, angular fretwork and gently tapering front legs that curve out toward the bottom. For a touch of modern comfort, the wood stool is paired with a plush, beige linen drop-in cushion. A natural, limed oak finish gives a relaxed quality to the stool, ensuring it does equally well dressed up or down.